My husband and I, after many failed attempts at a compromise for the theme of our nursery, settled on a general “books” theme. That way, he gets to incorporate elements of The Hobbit and I get to pay homage to Goodnight Moon and everyone’s happy. Imagine my dismay when I happened across an article from 2010 called Picture Books No Longer a Staple for Children. It was disheartening, to say the least, thinking that my son will have fewer picture books to help cultivate a lifetime of reading. In the article, it discusses how picture books just aren’t selling well, and publishers don’t put out nearly as many as in the past. One of the reasons that they explain is an expectation for kindergarteners and first graders to be reading chapter books—a time when they’re just developing their independent reading skills! Beyond that, picture books develop a different set of skills than books filled with text do, and those skills are very important for reading. Books with lots of images not only help support the story when a child needs context in reading the text, but the illustrations also allow children to participate in the story through “reading” the pictures. It’s okay if the story they create from the pictures doesn’t match up to what the author penned. It’s helping build children’s creativity, analytical thinking and ability to fill in the gaps from what is shown in the picture (dialogue, plot, character motivation, etc). These are skills that are critical when they transition to books without pictures. That’s where we come in as educators. Let children explore the books that draw their attention. If that’s a chapter book, great! You can support them by describing how the pages feel to an infant or toddler (let them describe it, too, if they can), showing a preschooler how the words are written left-to-right/top-to-bottom or fostering a school-ager’s reading comprehension skills through open-ended questions. If it’s a picture book, that’s great, too! You can support them in many of the same ways: describe the pages and pictures with the infant and toddler, ask open-ended questions to the preschooler about what they think is going on in the story from pictures and extend the experience for the school-ager with opportunities to form opinions and inferences from the pictures. All types of books, whether that’s picture books or chapter books or the dictionary, stimulate reading skills in children. It’s important not to set aside entire genres simply because a child had reached a chronological age. In the meantime, I’ll keep searching for picture books to add to the nursery’s bookshelves and my son and I will get to listen to my husband’s baritone voice recounting the tales of Bilbo Baggins. As long as we can accept some drool, teeth marks and taped-together pages through the process, I think we’ll all be just fine. What are your thoughts about picture books for children of all ages? Please share them in the comments! This entry was posted in Best Practice, Early Childhood, Infants and Toddlers, Preschool, School Age and tagged books, reading with children on June 18, 2014 by Janine Rigg. Recently our staff gathered together to celebrate the upcoming arrival of a little bundle of joy and the baby shower games really got our staff’s competitive juices flowing. It was fun to watch those who shouted out the answers to the names of the celebrity baby photos and equally as interesting to realize you are completely out of touch with the celebrity world. But when the next game announced was to recognize the story quote from children’s books, it was on like Donkey Kong. I had this. Story time in my classroom was the highlight of my day and my collection was deep and wide. My considerable personal collection contained the classics such as “Goodnight Moon” and “The Very Hungry Caterpillar” and new additions such as “Llama Llama Red Pajama” and the “Fancy Nancy” collection. I took every opportunity to incorporate reading into many activities throughout the day and had a blast making it come to life for my preschoolers. Books on CD, character puppet making and theatrical performances were just some of the regular occurrences in our room. Trips to the library were exciting escapades of what new books I would find and bring back for the week! The children knew every Monday meant new books to read and rushed to the carpet with anticipation. I was excited too! They were wide eyed during “Where the Wild Things Are,” and it was amazing to hear the way they said the words along with me during “Chicken Little” and “The Mitten.” We laughed heartily as we encouraged the very curious pigeon to NOT drive the bus or to share his beloved hotdog and bellowed “NO! !” as David chewed with his mouth open or ran to the bus in his underwear. I used every opportunity to teach them new words and encouraged them to use the new words in sentences throughout the day. Their vocabulary exploded and I had a blast observing it. Hearing them use the word “fantastic” to describe their chicken nuggets and their friend’s artwork warmed my heart. It just doesn’t get any better than story time. As I numbered my paper with great anticipation at the start of the game that day what didn’t occur to me was that I was surrounded by early childhood experts and we all were equally aware of the great importance of reading to young children. They too had many they knew and favored and had as vast wealth of children’s literature knowledge as I did. While I did fend well, proudly the only one who knew of the great “Skippyjon Jones,” I did not win the game. I did learn of several new books to add to my cherished collection and realized while we all know and value the importance of reading to young children, it also impacted us personally as well. By the end of the shower we all were discussing our own personal favorites as children, as parents and as educators and I walked away with new titles to seek out and explore, even with my older children. Remember that developing the love of reading starts at a young age but can be continued throughout life as they grow and develop into elementary students, adolescents and adults. What are some of your favorite stories to share with your children and students? What ones have you seen really impact them as well as challenge them to think and reflect? What ones really just made you all laugh, funny but all the while teaching them (and you!) to find humor and comedy in life and sometimes in yourselves? Perhaps at your next staff meeting you could initiate a fun quiz for your staff about their story book knowledge. You may find out a lot more about children’s literature, your fellow coworkers and yourself. I mean, “Holy frijoles!” when it comes to reading, what have you got to lose? This entry was posted in Preschool, School Age, teachers and tagged books, reading on June 4, 2014 by bdoverspike. Shouldn’t every month be National Reading Month? There is so much energy and time invested in promoting reading as the single most important activity one can do (and it is! ), and yet so little time is actually spent reading! 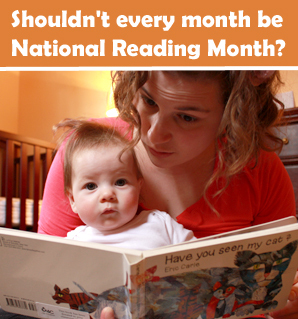 Many states and organizations promote a single month or day for reading, but these months and days are random and do not correlate to anything specific. Reading shouldn’t happen in planned out Hallmark-holiday style. Reading is something that happens all day every day. Reading month, like many other randomized celebrations (Black History Month, Valentine’s day, Father’s Day or Movember, for example) is not something that you should be made aware of for just one day or one month. Reading, like heritage and disease, is something that should be done, discussed and acted upon every day of every month! There is a ton of research into how and why. Not only is reading good fun, the language and literacy skills needed to do it well are important skills to acquire for future success in school and life. Reading also helps soothe the mind, takes you to faraway places or back in time to witness great moments, and ordinary ones, too. I wonder why we think that giving reading such short thrift will provide us with the results we desire. If we want to see a higher percentage of early language comprehension and a higher percentage of reading at level in third grade, we should read every day (these and more outcomes are in the Strive Report Card). Reading also contributes to higher scores on the SAT, ACT and the NAEP, and with children in the United States trailing our global neighbors, it’s never been more important. With the onslaught of technology and how rapidly our youth have taken to it we might be at a crossroads. But somewhere between winning texting awards and writing fluent essays we must hold on to what we know leads one to a life of success. So read to your children and provide them opportunities to talk about their world. This entry was posted in Best Practice, Early Childhood and tagged books, child care, children, early childhood education, early literacy, preschool, reading, teachers on February 4, 2013 by Josh Craig. Looking for fun? You’ll find it at the library! Advertisers spend billions of dollars telling children exactly where to find happiness and satisfaction: fast food restaurants, toy stores, amusement parks. But there’s another place in town offering our children happiness, satisfaction and a lot more: your local library! Most libraries can’t afford a splashy ad campaign to entice our children, however, so it’s up to us to get them interested! 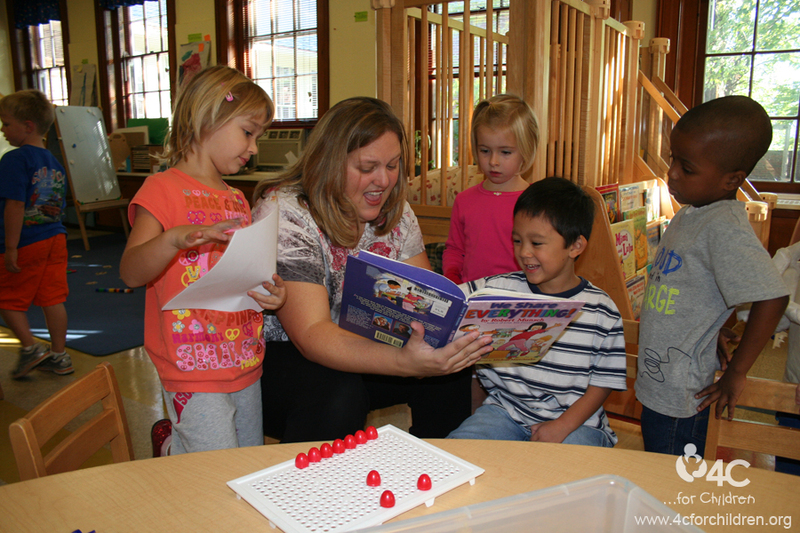 Begin by promoting weekly library time for your family in your center or child care home. Schedule the library to come into your center for monthly visits and make this as special as a TV show or holiday. Educate the parents in your programs about the importance of the library and all the library has to offer. Share with them that the library offers comfortable places for them to sit with their children and enjoy books together. Reading stories to your child can be a time of closeness and sharing. Be sure to build in time for it at every library visit, and explore the other resources your library has to offer! The children’s section in many libraries includes magazines for the very young, puzzles, tapes to listen to and toys to play with. Libraries are now equipped with computers and computer games, but nothing beats a good old fashioned story time. Get to know your librarian. You want children to see that librarians are approachable grown-ups who can introduce them to good books. Question the librarian about where to find books that are age-approproate. 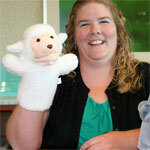 Ask about special events at the library: movie nights, craft activities, puppet shows, cooking lessons and much more. Librarians know lots of ways to keep children interested in stories and books. 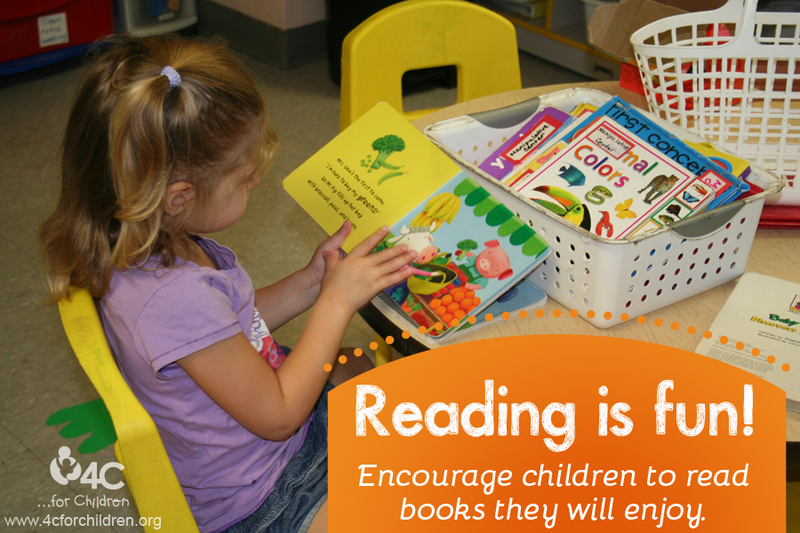 Watching one in action is a good way to pick up some tips on reading to your own children. Try to end each visit by following a predictable routine. You might look at something interesting such as an aquarium or a favorite picture first, then check out books and wave goodbye to the librarian. Doing things the same way each time makes it easier to get your children to leave the library, but if you’re lucky, they won’t want to! This entry was posted in Directors & Administrators, Early Childhood, Family Child Care, Preschool, School Age and tagged books, child care, children, early childhood education, education, families, libraries, library, literary, parents, reading, school, teachers on November 2, 2012 by 4cforchildren.